Bikes and The City in collaboration with BikeNOPA, brings you the weekly series: Dads on Wheels. 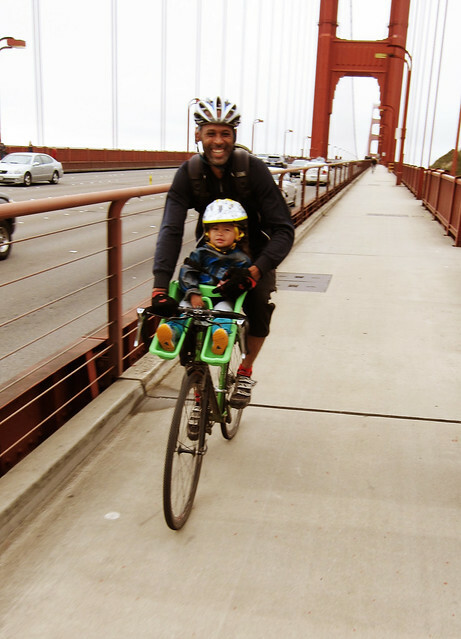 Every Tuesday, we have be featured dads from all over the city +around the Bay, and the ways they get around town with their kids. Please check both our blogs for the current profiles. We are coming close to a series end so don’t be shy and comment away your thoughts and leave comments for the featured riders! off roading with dad by deanne. How old are your kids and why do you bike with them? When did you start them biking? I have on daughter, Simone(2yrs). Cycling is a great way to spent time together exploring the city and beyond. She love riding! She was 10 months old when she had her first bike ride. How often do you bike with your kinds now ….and do you bike with them for fun or also for taking them on errands, getting them to school? We ride at lease once a week. 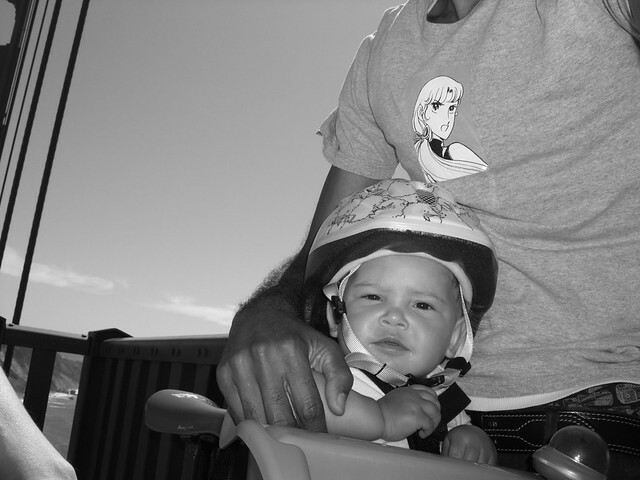 We bike for fun, running errands and to day care. 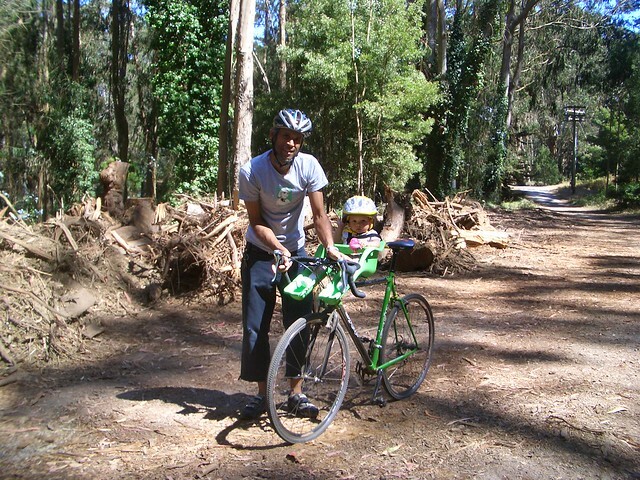 What’s the best thing about biking with your kid(s)? Getting her outside and enjoying the feeling of cycling. I would love for her to have no fear but respect traffic. 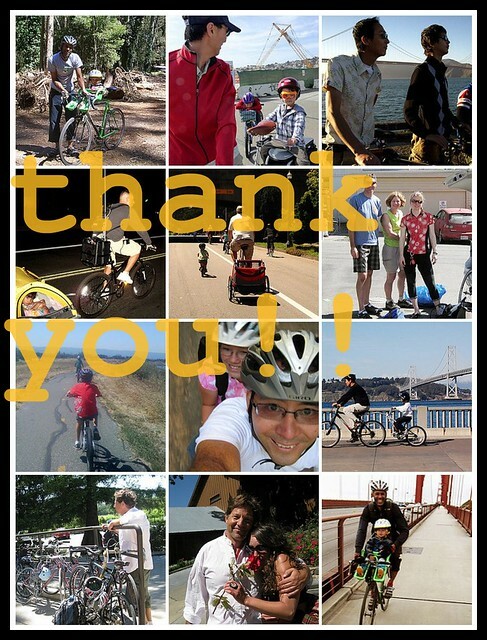 What do you say to relatives or friends who think the streets of San Francisco are not safe for kids to bike? I’ve only heard that once and my reply is where in the US are the streets safe walking cycling or driving? What makes a route or street OK for taking your kids biking on it? Bike lines, Sharrows or little traffic. Is it even harder getting kids ready for trips if you’re traveling by bike? How often do you bike on your own: recreation/exercise or for transportation also? As much as possible. a few time a week plus every weekend. 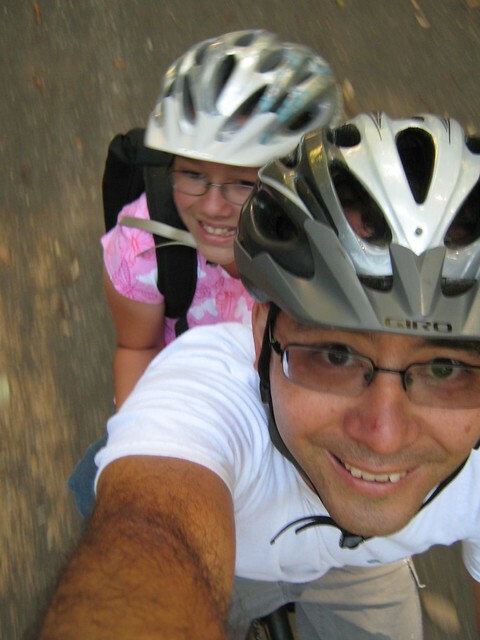 Any advice for other dads who are thinking about biking on their own or with their kids? At stop lights I also look drivers in the eyes so they know I’m riding with my child. Be confident with your cycling skills. Be aware of traffic. Bikes and The City in collaboration with BikeNOPA, brings you the weekly series: Dads on Wheels. 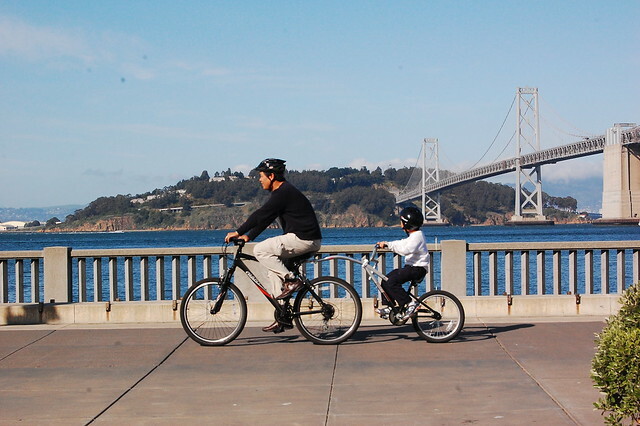 Every Tuesday, we have be featured dads from all over the city +around the Bay, and the ways they get around town with their kids. How often do you bike with your kids now ….and do you bike with them for fun or also for taking them on errands, getting them to school? Not too often as they are grown up and moved out. For fun! 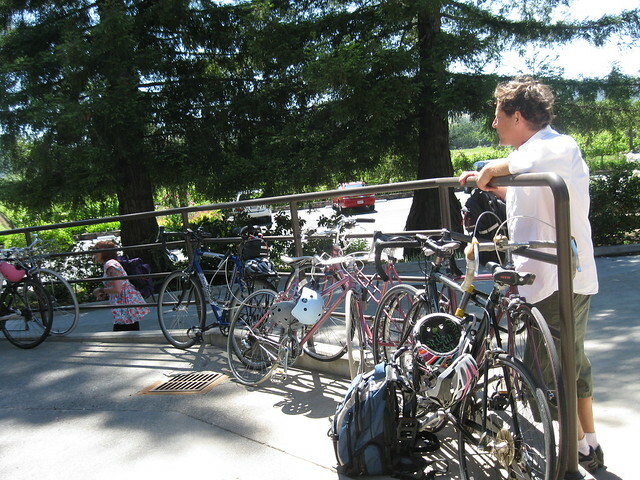 Kristen: My Dad took me and 6 of my bikey girlfriends on bike rides through Sonoma wineries for my 30th Bday this year. He saved the day by fixing bikes, fixing wounded friends and biking alllll the way back to the campsite when my derailluer broke off my bike! He’s my hero! If your kids are older, how did you get them started: a Skuut bike, a trailer-bike, training wheels or something else? Kristen: It was a long time ago and we lived in an apartment, I remember my Dad running along side of me. I also used to ride along with him while he would jog! Less traffic, less worn road, less grates to dodge. Kristen: Makes it better for everyone all around! The wiggle is so much nicer to ride on these days! Not too much I imagine as long as the bikes are easy to get to. Kristen: Dad! 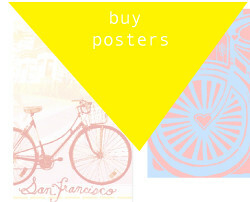 Let’s take a trip by bike soon! 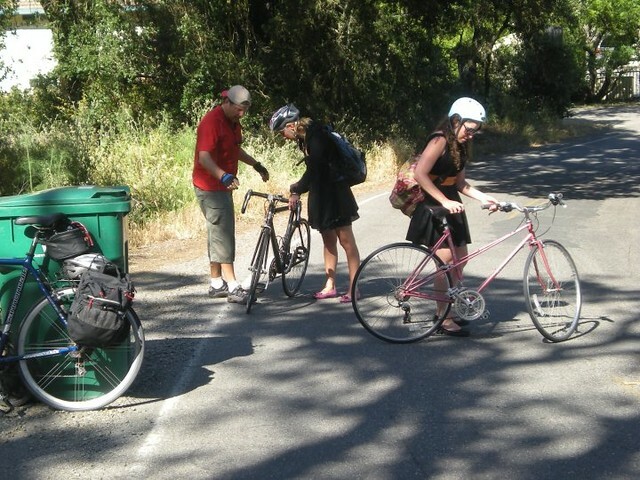 If your kids have reached their teens, are they still biking? Do you encourage them to? Kristen: I’m a 30 year old cyclist and my Dad completely encourages me! He is holding a fundraiser this winter for my Lifecycle team! 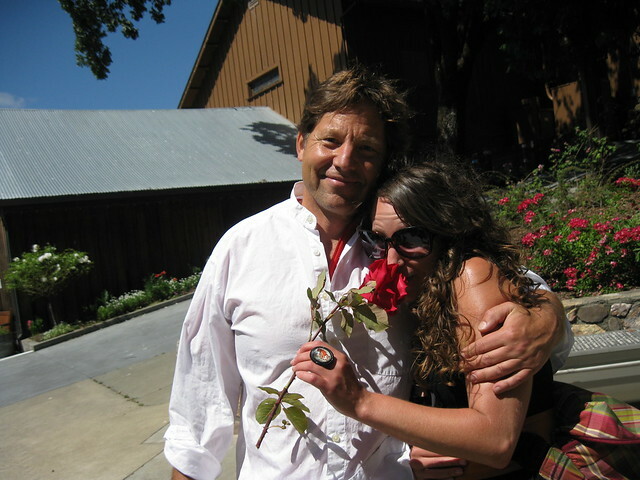 Gracias Father-Daughter duo Keith y Kristen!! 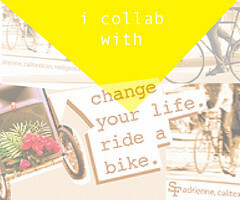 Bikes and The City in collaboration with BikeNOPA, brings you the weekly series: Dads on Wheels. Every Tuesday, we have featured dads from all over the city and the Bay, and the ways they get around town with their kids. Please check both our blogs for the past profiles. 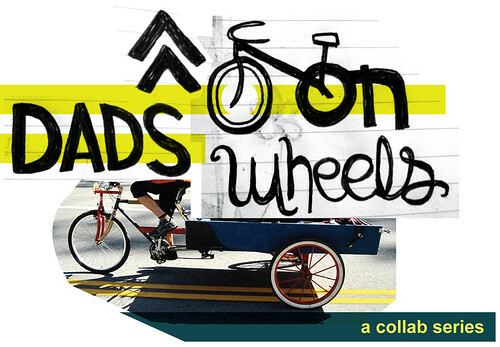 Bikes and The City in collaboration with BikeNOPA, brings you the weekly series: Dads on Wheels. Every Tuesday, we will be featuring dads from all over the city, and the ways they get around town with their kids. Ivy is a pre-teen, my son Ian is a teen now. They’ve been riding in bike trailers since they were toddlers. Ian gets around town on bike by himself with no problems and knows how to use the bus as well, though to be honest he really prefers getting a ride in a car. I even had to ask a friend’s mom not to give my son a ride every time he asked! Ivy and I go to the local farmers’ market, dog park, and shops by bike, and Ivy came along at a recent San Jose Bike Party. 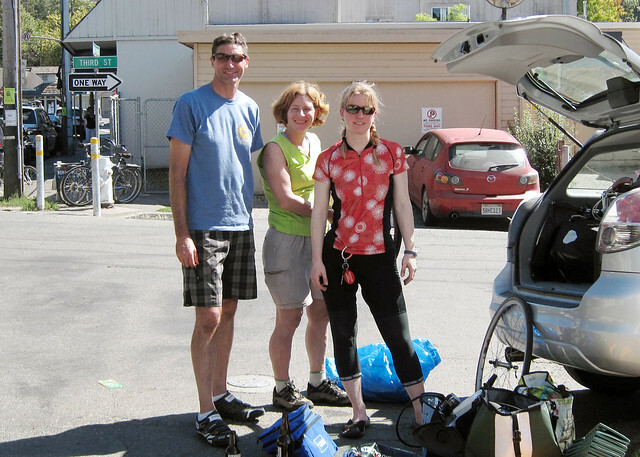 As a family, we’ve gone camping by bike, biked across the Golden Gate Bridge to Sausalito, and spent a weekend Sacramento via Amtrak, where we biked up and down the American River and around the downtown. I’m an assertive cyclist, but children don’t have the experience they need to bike in heavy traffic. They don’t anticipate the ebb and flow of the road. Many children, for example, will stop when they see a large vehicle approaching in a cross street, even when they have the right of way. When cycling through dynamic traffic, I stay behind my daughter and give her instruction on where to go, when to merge and so forth. I also act as a sort of human safety flag, staying visible and running interference for her. I’m not ready to take my daughter cycling on (for example) SF Market Street, even with all of the bike facilities, where someplace like the Embarcadero works very nicely. I wasn’t much older than she is now, though, when my friends and I were biking in impossibly heavy urban traffic that would have concerned my parents if they knew about it. The perfect route or street for biking is maybe the dead end cul de sac in the suburbs, but that kind of development is precisely what gets us in trouble with long commutes and dangerous driving! I open up the garage, grab the bikes, we hop on and go. Every once in a while I need to ensure bike light batteries are charged up and the tires are pumped, but these maintenance issues are no more onerous than checking the oil in a car. I’m not car-free, but I’ve been biking to and from the office just about every working day for over 20 years now. When either of my children come to work with me, they do the same bus / train / bike commute as me. Don’t start out with a 40 mile extreme adventure — they’ll hate you and cycling forever. Instead, start small with a ride to the corner store and make the experience fun and worthwhile. Give a small reward after the ride. Don’t sweat the time — we break frequently for ice cream, snacks, drinks, banana slugs and other fun stuff. If riding in cooler or wet weather, make sure the kids are dressed appropriately — smaller children lose heat more quickly than adults do, especially if they’re towed on a trailer. You might be sweating at 60 degrees while they’re shivering from hypothermia. 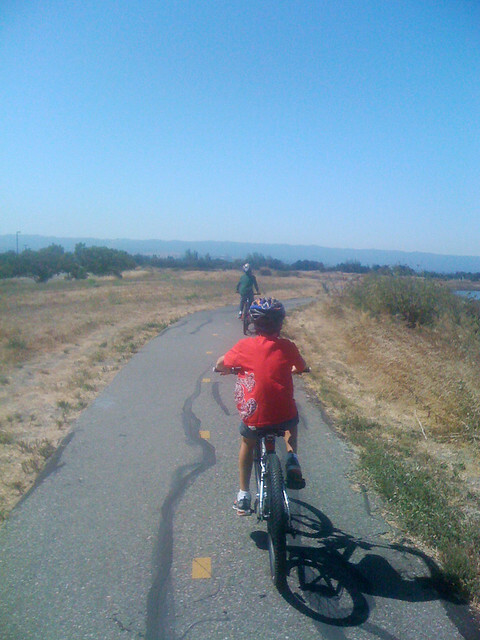 Shoreline Park: Today we rode on Stevens Creek Trail from downtown Mountain View to Shoreline Lake (for lunch at the Lake Café) and back, about 13 miles. Twin boys, age 10 and 10, in fifth grade. It’s good exercise for them and helps them develop strength, coordination, balance and an appreciation for the outdoors. It’s also a great bonding experience with Dad! They started on tricycles at age 2 and bikes with training wheels at age 3. We bike together about once a week, mostly on suburban trails, bay trails and some single track, mostly for fun. They also bike to school once a month with a group of friends. Mostly training wheels, although I pushed them around in a B.O.B. jogging stroller at 9 months to get the feeling of moving! The stories we tell over the dinner table afterwards! Like anything else, if you apply good parental judgment and supervision, you can minimize the risk and have a lot of fun. It’s important to teach kids how to ride safely, to pay attention to hazards and to be confident. Of course it’s best if the route is completely closed to cars, such as a bike trail or during City Streets. However, low-traffic routes with bike lanes are fine if I am riding with them, coaching and supervising them. It does take some extra time, but if you are organized, you can minimize the impact. For example, if you take care of daily maintenance and safety checks, such as pumping up the tires, early in the morning while the kids are sleeping, and organize their helmets and other gear, it saves a lot of time just before the ride. They’re only 10, but I’m hoping we can do some mountain biking and bike touring/camping together when they get a little older! I’m on my bike almost every day running errands, working out, and riding with friends. Start now, because they will grow up before you know it! Like anything else, getting into a regular routine makes it much easier and more natural to pick up the bike and is part of a healthy lifestyle. We are fortunate to live in a region with an amazing mix of riding environments for people of all ages, and developing a positive attitude and confidence in cycling will enhance your kids’ quality of life well into the future. 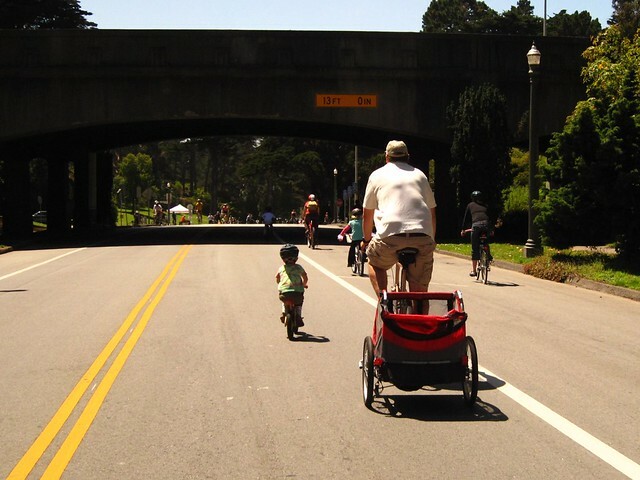 Snapped this shot of a dad with his kids during Car-Free Sundays through Golden Gate Park.